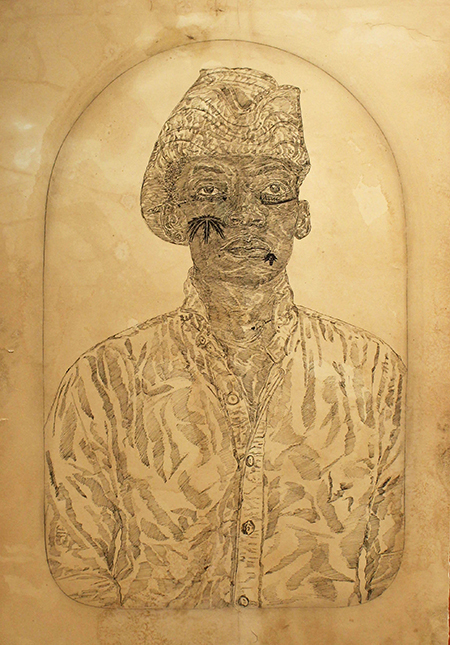 Since 2006, Umar Rashid has been creating a narrative for a fictional colonial empire called Frengland, using the nom de plume Frohawk Two Feathers. Through vivid storytelling comprised of images and words, the L.A.-based artist explores his identity as an African American, while prompting viewers to consider their own personal and shared histories. For Rashid, who was born in Chicago in 1976, history is neither linear nor circular. Instead, it has a fluid quality that lends itself to conceptual time travel, and interjecting the geographies of the places where he exhibits his work. Rashid turns to the history and cultures of southern Arizona for “What is the color, when black is burned? The Gold War, Part 1.” They’re interwoven with real and imagined histories of other places and times, using characters that blend period elements with contemporary ones to punctuate issues of class, race, and gender. Here, his tale focuses on Apache, Pueblo, and Navajo efforts to thwart the Spanish colonial government amid its quest for gold. The exhibit includes a circle-shaped ink and acrylic canvas piece (“Desert People. Desert Power. A cosmology of sorts.”) with a crowded, Basquiat-like quality. Its imagery includes saguaro cactus, snakes, an arrowhead and bars of gold labeled “Oro.” The words Rashid incorporates hint at his humorous and ironic sensibilities: Paleface, dunes, invasive species, etc. In one of two galleries housing the exhibit, there’s also a copy of the Frenglish story tied to this particular show, and a video featuring the artist talking about his work. He’s sporting a three-cornered hat, like those worn in American colonial times, thus flipping the script on who’s the slave and who’s the master. It’s just one more way the artist plays with concepts of history, time and power. The exhibition also includes sculptural elements, including a trio of crosses resembling grave markers that prompt reflection on migrant deaths during desert crossings, as well as portraits of his characters. Like the artist’s maps, the portraits are often created with ink on paper, dyed with coffee and tea so they look aged. Through his choice of materials, Rashid effectively conveys the centrality of commodities to systems of power and oppression. His characters for this show include Uma and Uta, twin female assassins who each wield a weapon and flash a gang sign. Calling attention to historical conflicts between Hispanics and Native Americans, which still permeate parts of Southwestern culture, the artist draws one person wearing a lucha libre mask, lunging at another who’s wearing a lone feather as a headdress. By incorporating local histories into the exhibition, Rashid assures that we won’t see it as mere theoretical or aesthetic constructs. Instead, his works beckon us to consider the flaws in how the stories of the spaces they occupy have been told. Rashid’s work is particularly poignant within the context of current American political life, where claims of “fake news” and unapologetic peddling of propaganda threaten to obliterate the blurred line between fiction and fact. Perhaps, Frohawk Two Feathers can help pull us back from that abyss.